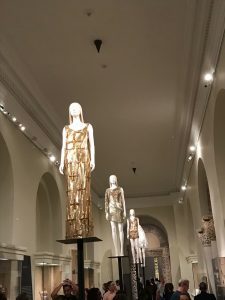 Heavenly Bodies: Fashion and the Catholic Imagination exhibition —at The Met Fifth Avenue and The Met Cloisters—Art have had a record-breaking number of visitors since it opened its doors on 10 May. 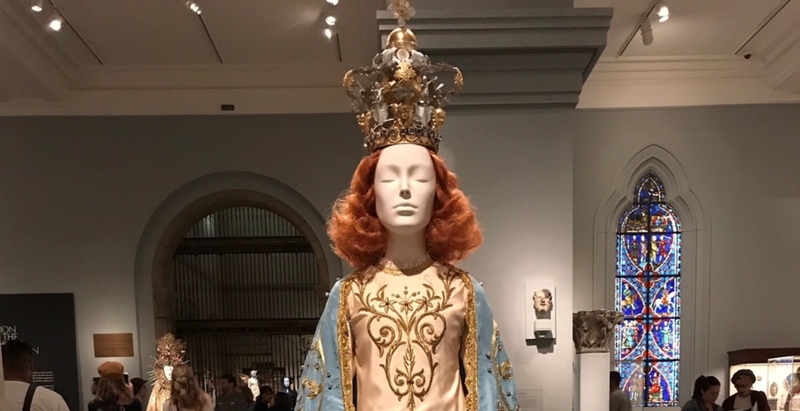 The Costume Institute’s spring 2018 exhibition features a dialogue between fashion and medieval art from The Met collection to examine fashion’s ongoing engagement with the devotional practices and traditions of Catholicism. Many of the designers whose work is represented in the exhibition, such as Gianni Versace, Thom Browne, House of Dior, Domenico Dolce and Stefano Gabbana, have a personal connection to Catholicism. Comprised of 25 galleries, it is the largest exhibition to be staged at the museum and features designs from Thierry Mugler, Cristóbal Balenciaga, Thom Browne, Azzedine Alaïa, John Galliano for the House of Dior, Pierpaolo Piccioli for Valentino, Elsa Schiaparelli – just to name a few. Set to conclude in just a week, Heavenly Bodies exhibition stands a chance of overtaking Treasures of Tutankhamun which showed in 1978 as the most visited exhibition of all time. Get in Formation: Glistening dresses from Versace archives.